Besides being the heart of the home, the kitchen is also usually the room with the highest traffic. When choosing window treatments for kitchens, select those ones that can endure everyday wear and tear, as well as make your kitchen look warm and inviting. 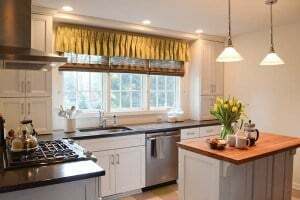 If you’re shopping for window treatments for your kitchen, here are some basic considerations. protective qualities, and they still allow for some diffused sunlight to enter a room. Pleaded shades are also a good choice for kitchen windows as they protect from sun rays, while allowing enough light. If you want total control over sunlight, buy opaque window treatments or coverings that have a lining containing a layer that prohibits light. These window covers are called blackout shades. When you close these shades, the shutter slats and blinds give your kitchen total sun blockage. If you want even more protection, you could apply UV film or adhesive to older window panes. To find out how much privacy your old window coverings have, conduct a privacy test. After turning on your kitchen lights, at night, go outside to determine if neighbors can see through your windows. If privacy is a top concern, choose window coverings made of screening materials that block interior views, while still letting in some light. Good privacy window coverings include roller shades or Roman shades. If you think about it, kitchens generally contain a lot of straight lines, such as kitchen appliances, cabinets and counters. Because just about everything in a kitchen has straight lines or is square-shaped, why not use window covering featuring soft curves. This is especially a good solution if you want to open up space in a small kitchen. Therefore, consider arching a valance over your kitchen sink. You could also include a box-pleated valances that have curved lines on the bottom. Selecting window coverings for kitchens can be problematic because it’s easy for kitchen odors and grime to soak into curtain and drapery fabrics. Therefore, it’s often best to use shutters or blinds. Some of the most popular window treatments include wood, woven wood and humidity-tolerant faux wooden coverings. These types of window coverings are also well-suited for country kitchens. If you want more of a contemporary and chic look, use cell shades. Aluminum blinds are also exceptionally durable and come in a wide range of colors to match or complement your existing kitchen colors. Kitchens that are small can be visually enlarged by using cooler colors which can make a room not only larger, but also brighter. On the other hand, warm, dark colors can make an oversized kitchen more welcoming. To make your kitchen look more personalized, select window coverings made from materials, designs and textures that depict your lifestyle. Sunshine Drapery has a wide selection of shades, shutters, blinds, curtains and other window treatments. We have window coverings in many different styles, suited for every room in your home.